Wellingborough: Scott Bader & Co., 1957 pp viii 120. Illustrated with photographs showing examples of moulded polyester used in boats, cars, buses, lorries, locomotives, aircraft, scooters and domestic items from the 1950s. Limp card covers with edges overlapping page block. Slight fading to spine. A Good clean copy. London: Hutchinson, 1967 pp x 118 including index. Illustrated with photographs, maps, drawings and tables. Black cloth, gilt. Near fine in Very good protected dustjacket. Lanarkshire Development Couincil, 1972 White glossy card covers with narrow rectangular library stamp in top margin and October 1972 written in ink above. Yellow sellotape mark around base of spine. Otherwise a clean unmarked copy. London: The Institute of Petroleum, 1955 pp viii 185 plus xii pages of pictorial adverts at the back illustrating road tankers, refineries and rail tank wagons etc. With illustrations and diagrams in the text. Red cloth. Ex H.M. Board of Customs & Excise Library with lightly embossed stamp on front endpaper and half title page and stamped number at top of front endpaper, half-tile and title page only. Otherwise a bright clean copy. London: Copper Developement Assoc., 1967 CDA Publication No. 52. pp 48. Illustrated with photographs and a coloured frontis. Card covers. London: The Bibliographical Society, 1959 Reprinted by The Oxford University Press from The Transactions of The Bibliographical Society. pp 100 to 116. Illustrated. Printed grey paper wrappers with a few minor marks. London: Educational Supply Association Ltd., 1960 An ESA Information Book - How Things Are Obtained series. pp vi 90. Illustrated with photographs and drawings. Pictorial paper-covered boards. Near Fine in Good protected dustjacket with a few edge tears and chips. London: Department of Education of the International Wool Secretariat No date (circa 1948) pp. 86. Illustrated with photographs. Printed yellow and black card covers with light wear to head and foot of spine. Owner's name inside front cover. Very Good. London: The Timber Development Association Ltd. pp 154 including index. Red cloth, gilt with white ink number on slightly faded spine. Very Good. Wellwyn Garden City: Trade Journals Ltd., 1959 pp 161 plus 7 pages of adverts. Illustrated with photographs and tables. Green cloth, gilt, a little faded at spine and with some minor surfaces scratches. Very Good. Birmingham: Kynoch Press, 1927 pp119. Illustrated with examples of type specimens and page set-up examples. Black paper covered boards with green cloth spine, gilt with white number at base of spine. Ex-Library with small neat round stamps in top margins of two prelim pages and in bottom margin of last page. Title page clean but neat number written on verso. A little light ear to rear top corner and leaves 109 and 111 have tiny pieces missing from top corner. Good+. Oxford: Pergamon Press, 1975 pp. xiv 306 including index. Illustrated with photographs diagrams and tables. Pictorial laminated boards. Near Fine. THE NORTH SEA COD AND THE ENGLISH FISHERY Laboratory Leaflet No. 61. 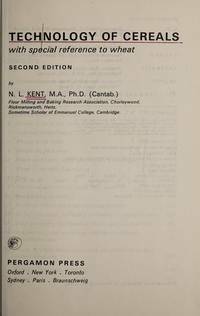 By Macer, C. T. and Easey, M. W.
Lowestoft: MAFF Directorate of Fisheries Research, 1988 pp 22. . Illustrated with maps and diagrams. Stiff plastic-covered pictorial paper wrappers. Ex-College Library, stamped inside covers, rear endpaper and top corner of title page from which labels have been removed. Otherwise Very Good. Manchester. : Manchester Guardian, 1921 pp vi plus 12 contents pages 271 plus lxxvi pages of commercial adverts. Illustrated with photographs, drawings and folding maps. Original blue paper-covered boards, with dark blue cloth spine, gilt. Ex-Library with new endpapers. Round perforated stamp on title page, ink number on verso and small round ink stamps on contents page and on the backs of the maps. Stamped gold number on spine. Water stains to rear fore edge and bottom front corner and wear to corners of boards. Contents Good. Derbyshire: Landmark Publishing, 1999 pp. 256 including index and bibliography. Illustrated. Green boards, gilt. Fine in Fine protected dustjacket. Middlesex pp xxxvi 312. Illustrated throughout with a variety of hardware and domestic equipment, including locks and latches, door furniture, tools, ironwork, heaters, toilet fittings and plumbers goods etc. Green boards, gilt. Top edge of page block spotted. Otherwise a Very Good clean copy. London: Applied Science Publishers, 1978 pp. x 233. Illustrated with photographs and diagrams. Black boards, gilt. Ex-College Library with new endpapers. Lightly stamped on fore edge of page block and with stamps in bottom margins of a few pages only. Very Good in Very Good protected dustjacket faded at spine and with a little yellowing to rear top edge and spine edge.